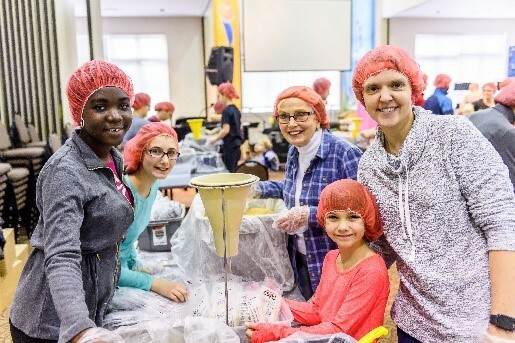 WILDWOOD – With music pulsating throughout the East Hall of the Wildwoods Convention Center, more than 200 volunteers working in unison systematically and excitedly helped package 30,000 meals in just under an hour and a half at last year’s Annual Conference session of GNJ. In what will be the sixth year in a row, the 2019 conference will carry on the tradition of partnering with Rise Against Hunger’s effort to feed people around the world in a bold mission to end world hunger in the next decade. Last year, volunteers nearly doubled as churches, groups and individuals from Wildwood and the Cape May County community were invited to join participants. Since 2013, GNJ has packaged over 150,000 meals, providing an opportunity for the annual conference to engage a lively mission to support the world’s most vulnerable. The organization, founded by a United Methodist minister in 1998, focuses on mobilizing a global network of hunger champions that package nutritious meals to distribute to partners in countries around the world who are best able to address the causes and effects of hunger based on their local presence and expertise. Rise Against Hunger’s monitoring and evaluation process ensures the meals distributed by partnering countries are used as a tool to change lives by promoting education, improving students’ health and nutrition, addressing gender inequalities, stimulating economic growth and fighting child labor. On February 9, Caldwell UMC held a Rise Against Hunger event, packing 20,000 meals with the help of 200 hundred volunteers. $4,257 was raised to cover the meal costs. Community members, scouts, Kiwanis, and local businesses all participated in the morning and afternoon packing sessions. “Rise Against Hunger not only allows our clergy and lay leaders an opportunity for hands-on service but also educates participants around the root causes of hunger,” said Rev. Hector Burgos, Director of Connectional Ministries and forthcoming Capital District Superintendent. “It helps them imagine new ways to be in mission in their local communities and the world.” Burgos applauded the organization for recognizing that ending hunger is more than just feeding people but also expanding hunger-fighting programs through regenerative mission. This year’s meals will be shipped from Rise Against Hunger’s Philadelphia warehouse to impact thousands across the world.